I remember painting a rainbow in watercolours, many years ago. The lightest of tints were added for each colour and built up, on the clean paper, until the correct intensity was reached and that was that. Oil painting is different. ‘Alla prima’ oil painting is different again. This painting was completed after about 6 hours, less than 2 hours were spent actually painting. Most of the time was spent waiting for the solvents to evaporate and the Liquin to become tacky. If I was painting over a number of sessions and waiting for the previous layer to dry, the rainbow part would have been similar to the watercolour technique. By painting a white band and allowing it to dry, then placing transparent glazes on top with the rainbow colours. Glazing is not an option in ‘Alla Prima’ and this is where the fun starts. I would find it impossible to paint one of those distant narrow bands in ‘Alla Prima’. Let’s say, a semi-circle. 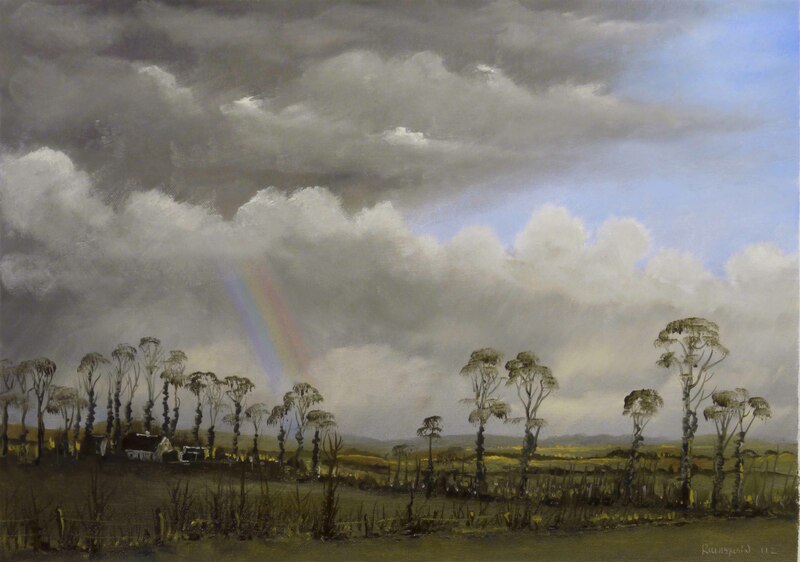 Looking at traditional paintings, like Constable’s, the rainbows always look odd, to say the least. Some of the colours have faded and others darkened and the band sometimes looks like a solid structure. I imagine they have suffered the effects of time as some of the glazing media of the time, were not totally permanent. So I will content myself with one of those ‘partial’ close up rainbows. Rainbows are transparent, and bright. Lightening a colour in oil painting involves adding white paint. Lets take the red colour. When white is added, its pink. Pink! That won’t do. But in ‘Alla Prima’ it has to do. This pink can look red with the help of the colours in the rest of the painting. At one stage the rainbow colours were too intense. The sky was dark and there was no foreground detail to distract from the intense colours. I started to drag white from the lower clouds over the rainbow colours making the colours lighter, including making the red more pink. And so the story goes. One change prompts another and fine adjustments are made over the entire surface to produce this faint fluorescent band. Like the smoke in the previous painting (here and here) its tedious and time consuming and the results are not always good. But its worth trying. The colours in the main body of the painting were: Burnt Sienna (red), Yellow Ochre (yellow) and Cobalt Blue (blue). Also used Raw Umber and black and white. The rainbow colours (which were not used in any other part of the painting) were Alizaron Crimson, Cadmium Yellow, Prussian Blue and Winsor Violet. The photograph is not entirely accurate with regard to colours, as is always the case. The camera sensor would appear to be more sensitive to blue, which appears more intense than the others (Lumix GH1). The video will make the process easier to understand and I will have it ready in a few days. This entry was posted in Oil Painting and tagged Art, Culture, Education, Inspiration, Irish landscape, Oil Painting, Oil Painting Instruction, Oil Painting Landscape. Bookmark the permalink. Hello and thanks for visiting my art blog. You have beautiful paintings and I enjoy your videos – very helpful! I like the variety of styles in your work. Thanks for visiting my site and thanks for the comment. Excellent work here. The scarcity of colour really makes it powerful, and the details of how you acheive your work are excellent as well. Look forward to finding the time to view loads of your work in the future. That painting scared me too. I couldn’t find a traditional oil painting with a realistic rainbow and this niggled me into giving it a go with my usual ‘slap-dash’ style of painting. I paint landscapes in stages, sky, horizon, mid and then foreground, more or less. A kind of ‘Lego block’ approach. I have a few pages with advice for beginners on my blog. Its traditional stuff but I think it helps remove some of the ‘painting anxiety’ which, for various reasons, is out there. How long have I been painting? Would you believe 40+ years and I’m self taught. That explains some of the crazy ideas I have.